Around the world, courageous individuals and groups act to safeguard human rights. 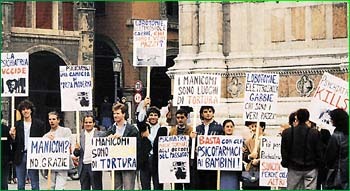 In Italy, CCHR volunteers demonstrate against psychiatric abuse in Milan (above). Dr. Thomas Szasz (below) has written 22 books debunking psychiatrys claims. stablished by the Church of Scientology to expose and eradicate psychiatric abuses of human rights, the Citizens Commission on Human Rights champions the rights of all peoples to be free of the unlawful and inhumane actions of criminal psychiatrists. Founded March 4, 1969, CCHR has expanded to chapters in 118 cities and 27 nations. One of the first actions undertaken by CCHR after its formation was to obtain the release of a Hungarian refugee, Victor Gyory, who had been wrongfully and involuntarily committed to Haverford State Hospital in Philadelphia. Once there, he was stripped naked, held in isolation against his will, and forced to undergo electric shock treatment. Szasz examined Gyory and found that the diagnosis of schizophrenic with paranoid tendencies was utterly false. What psychiatrists had said was confusion and babbling in tongues was actually Gyorys native language  the Hungarian language. The chief counsel for CCHR took Gyorys case to court, and succeeded in getting him released. It was an important test case on the constitutionality of involuntary commitment and electric shock administered without consent. That was just the beginning for the Citizens Commission on Human Rights. In the subsequent 26 years, the organization has assisted passage of 90 legislative measures in nations throughout the world, including laws to prohibit the use of electric shock treatment on children, to establish criminal and civil liability for psychiatrists who sexually abuse their patients, to prosecute insurance fraud, and to require stiff penalties for psychiatrists who engage in other illegal and unethical conduct. Legislation has also been passed to protect whistleblowers who report abuses by psychiatrists in government. CCHR has helped to bring about dozens of investigations by government bodies into psychiatric abuses. Most notable was a Royal Commission of Inquiry into Chelmsford Hospital in New South Wales, Australia. That two-year inquiry, the highest form of official investigation in Australia, investigated the horrors of deep sleep conducted by Harry Bailey and other Australian psychiatrists. Deep sleep  employed massive doses of barbiturates and other psychiatric drugs to knock victims into drug-induced comas for up to three weeks, while subjecting them to daily electric shocks. The unwilling and unwitting patients were shackled to their beds and left to lie in their own excrement. At least 48 people died as a result of deep sleep at Chelmsford, while thousands were left physically damaged or mentally scarred. After a long and dedicated battle, CCHR and the public prevailed and deep sleep was banned in New South Wales. CCHR spurred similar inquiries into deep sleep in the Australian states of Victoria and Queensland, and in New Zealand. CCHR also conducts broad public education campaigns. Through the efforts of CCHR, each year thousands of radio and television shows and newspaper and magazine articles expose psychiatric abuses and violations of human rights. In recent years, CCHR staff in different areas of the world have conducted surprise inspections of psychiatric institutions. In Italy, for example, members of CCHR have been accompanied by members of parliament and the news media during numerous surprise inspections of psychiatric institutions throughout that country. These inspections exposed subhuman conditions that patients were forced to endure at a cost to the state of up to $650 a day  double the expense of a four-star hotel. In response to the outcry generated by CCHRs exposes, the government plans to close all state-run psychiatric institutions in Italy by 1996.